Group shows built around right-thinking themes are rarely something to anticipate with glee. Again and again these exhibits, so favored by contemporary art museums, remind us that good intentions just don't get the creative juices flowing as much as we all might like. But "Badlands: New Horizons in Landscape," a show dealing with environmental themes at the Massachusetts Museum of Contemporary Art, bucks the trend. The range of work and the angles of approach to the theme vary tremendously. But a majority of the 20 participating artists do what they do with genuine conviction. If they are inclined toward political activism, it is the kind of activism that understands the difference between the artistic arena and the political arena and is prepared to act in both. If they are inclined toward lyrical responses to nature, they indulge these responses with their eyes wide open to the real plight of the environment today. Consider, for instance, the black-and-white photographs of Robert Adams. Born in 1937, Adams has created recent work that looks, at first glance, unprepossessing. Quite deliberately, Adams chooses views of landscapes that are shapeless and unendearing rather than composed and inviting. His vision draws us in with its modesty, but then it reveals many cherishable subtleties. Along with the detritus, the evidence of erosion, the sunspots and distant telegraph wires, there are signs of amazing hardiness, and a beauty that is frayed but real, like worn velvet. These images may seem bleak in their refusal to pander. But look at them long enough, and you are ready to believe Adams when he says, in an interview published in the catalog, that "the experience of making [them] was among the most joyful in my life." Adams is someone who talks sincerely (and credibly, I might add) about the importance of "getting out of the car as often as possible" and improving "our friendliness with trees." Ed Ruscha, another senior artist in the show, is a more guarded and troubling figure. His work here, from a 2006 series called "Country Cityscapes," adds a degree of menace that acts as ballast for the chirpier works in the show. Panoramic landscapes - vaguely reminiscent of work by Hudson River School artists like Thomas Cole and Frederic Church - are interrupted by strips of blocked-out text. The phrases that have been blocked out are indicated in the titles: "Noose around your neck," or "You will eat hot lead." The discord between image and (censored) text suggests something irreconcilable, even schizophrenic, in our relationship with reality, and it's from this that Ruscha's work gains its peculiar charge. A much more lyrical response to nature is in evidence in Mike Glier's series of small abstracted landscapes painted in oil on aluminum. I loved these paintings, which brought wildness and energy to a tradition of (mostly English) landscape painting whose exponents include Ivon Hitchens, Peter Lanyon, and Maurice Cockrill. I particularly liked that the curators of a show like "Badlands," with its strong political bent, would see fit to include such work - work that is anything but didactic, but is engaged, after all, with what it means to respond to nature as a present-tense phenomenon constantly in flux, rather than a sealed-off abstraction. Compare Glier's paintings to the photographs of J. Henry Fair, however, and you may develop a bad taste in your mouth. Fair makes color photographs that are tremendously pleasing to the eye - they just happen to be of environmental degradation. 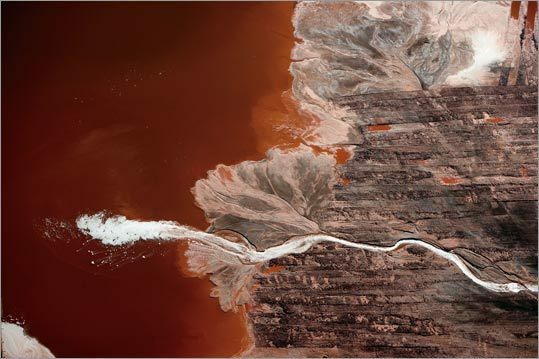 A large-scale work called "Expectoration," for instance, is an aerial view of bauxite waste from aluminum processing. In abstract terms, it's stunning. But then we register the reality of the subject (Fair coolly describes the process of aluminum production in an accompanying caption), and we're brought straight back to earth. The photograph made me think two things: how unreliable, even promiscuous beauty can be, and how almost willfully ignorant most of us remain about the industrial processes that sustain our lifestyles. Fair's work may be political in intent, but it is neither obscure nor condescending. Some of the other works in the show suffer a little in this regard - I'm thinking of the monotonous, research-laden films of Jane D. Marsching, who collaborated with the philanthropic design group Terreform, and of the half-ironic, half-sincere designs for tree-shaped wind turbines by Joseph Smolenski. "Give me a break," was about the best I could muster up in both cases. Still other work was visually interesting but messy in conception: the manipulated photographs of Anthony Goicolea, for instance, or the fantastical but ultimately rather hollow landscapes of Melissa Brown. Much better were the four extraordinary works by the Boyle Family, a groundbreaking British family of four (father, mother, son, and daughter) who worked together for decades until Mark Boyle, the father, died in 2005 (they continue to work as a trio). The works for which they are most famous are painstaking, life-size, and utterly convincing reproductions of randomly selected patches of the earth's surface, made from resin, fiberglass, and paint, and hung on the wall like pictures. In an effort to minimize the role of artistic decision-making, these patches of earth are selected by a blindfolded person throwing darts at a map. The Boyles then travel to the locations hit by the darts, throw a carpenter's right-angle in the air, measure out a predetermined rectangle from where it lands, and set to work. One piece here is a large reproduction of a rectangular area of rippled sand on Scotland's Isle of Barra, replete with dozens of worm casts. Another is a patch of cracking mud near England's Portishead crisscrossed by tire tracks and sprinkled with coal dust. Both are, against the odds, eye-poppingly beautiful. Sebastian Boyle, the son (now in his 40s), claims there is no political motive behind their work ("We want to see things for themselves," he says in an interview in the catalog). Rather, he says, they are simply concerned with "whether it is possible to give an account of even a small section of reality and say in any meaningful way that it is accurate." Their work feels poignant, then, in a show concerned with whether what we like to call "nature" can ever really be known. This question is asked in a different, though equally provocative way, by Vaughn Bell, who hangs little greenhouses (she calls them "Personal Biospheres") from the ceiling and invites you to enter them by poking your head up through a hole in their floors. Once inside, you find yourself in a humid little environment that resembles aspects of the Berkshire countryside outside. The exercise is mischievous and a little silly on one level. But it does two things: It makes us acutely conscious of the climate-controlled sterility of the gallery setting, its "unnaturalness." And it gently undoes some of the romanticism we habitually project onto all things green. Instead of admiring nature at a safe remove, we are thrust into it at nose level, and reminded of how smelly and unpleasant it can be. There were many other works I liked, but none more than Mary Temple's brilliant illusion of shadows cast onto an interior wall - not by tricks of light, but by the painstaking application of latex and wood stain onto the gallery floor and walls. The work, called "Northeast Corner, Southwest Light," is so subtle that you may not notice it at first. But once you do, it's hard to suppress a sense of wonder. "I want a whole room of those," I heard someone say, and I immediately thought, "Me, too!" But the work is more than just a neat trick. It speaks volumes about our alienation from nature, suggesting a relationship to reality no more secure than that of the prisoners chained to Plato's cave. Along with that, inevitably, comes a pessimism about our ability to protect nature, even as it enchants us.